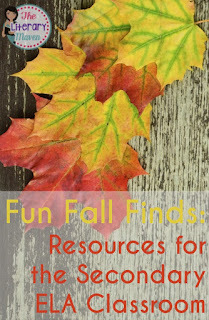 The fall can be a daunting time in the classroom. The weather is getting cooler and the days are getting darker. The excitement of back to school has ended and the "honeymoon" phase with your students is over too. Their behavior is less than perfect, they are starting to get chatty, and winter vacation seems so far away. You can bring some excitement back into your classroom and re-engage your students by recognizing some of the smaller holidays or events in between now and Christmas break, such as Halloween, Daylight Savings, and Election Day. 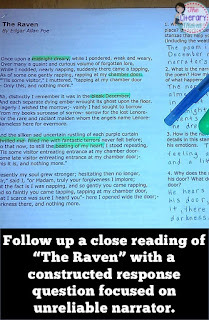 If your school frowns upon recognizing holidays of any kind, you can also bring some spookiness into your classroom with a lesson or two or even a unit on Edgar Allan Poe (one of my favorite authors!) combining fiction, poetry, nonfiction, and argument writing. Increasing the amount of nonfiction you use in your classroom can be a challenge, especially if your school is still using textbooks predominantly filled with literature. 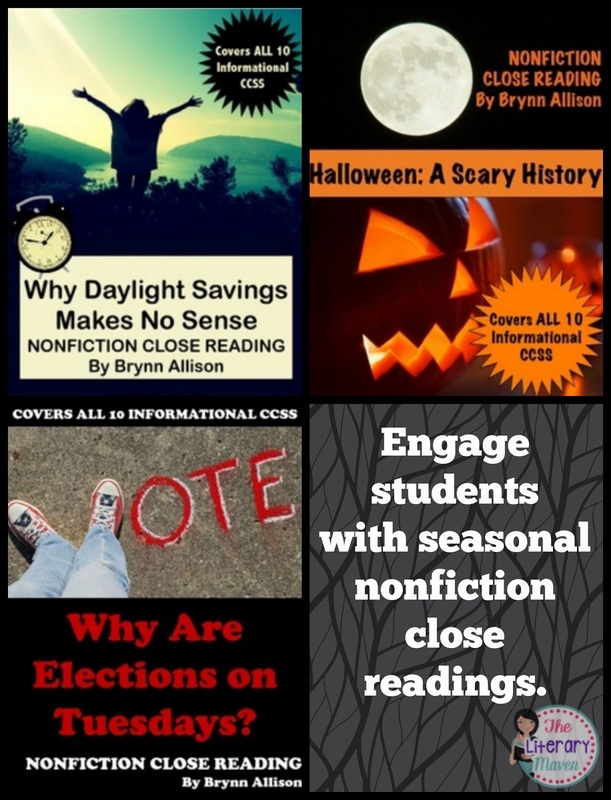 Seasonal nonfiction close readings are an easy way to incorporate nonfiction texts that your students will actually be interested in reading. Rigorous articles from sources such as The New York Times and National Public Radio are paired with ten questions aligned with the Informational Common Core standards. Suggested after reading activities make connections with math, science, history, and more. 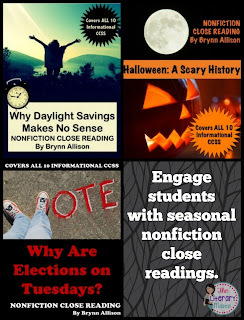 Check out my seasonal nonfiction close readings on the history of Halloween, why Daylight Savings makes no sense, and why Election Day is always a Tuesday. 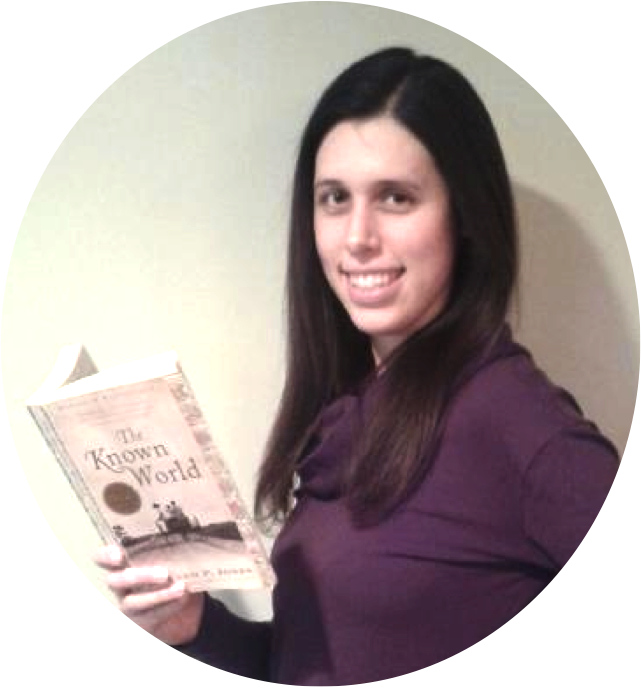 You can read about how one secondary English teacher uses my seasonal nonfiction readings in her classroom here. Look for readings on Thanksgiving and Pearl Harbor Day coming soon. If incorporating the holidays into your classroom is against school policy or just inconsiderate due to students' different religious backgrounds, considering spreading the scary spirit with author Edgar Allan Poe. It would be difficult for me to chose a favorite Poe short story, but "The Black Cat" is definitely one of them. I mean, who doesn't love a drunk guy who goes crazy and stabs his cat in the eye for ignoring him?! I use an adapted version of the short story to make it accessible for all levels of students. It's an excellent text for discussing the reliability (or unreliability) of a first person narrator. Like Poe's short stories, I don't think I could pick just one Poe poem to teach, but "The Raven" is the one I use this time of year. After doing a close reading with my students, we compare the original text with The Simpsons "Treehouse of Horror" episode in which Homer is haunted by Bart in bird form. Like "The Black Cat," it is a great text for evaluating the reliability of a narrator; students respond to a constructed response prompt on the topic. Another possible constructed prompt is examining how the setting creates mood in the poem. I also like to focus on summarizing with "The Raven" and ask students to write both a written summary and create a cartoon strip form of the poem. After introducing students to some of Poe's colorful characters, I keep their interest piqued with a series of nonfiction readings on the different possible causes of Poe's death, culminating with an argument essay in which students must select and defend a view point. A highly structured, step-by-step essay writing guide supports even my lowest level writers. During the writing process, I also use a choice board of activities which students complete independently while I work with small groups on their essays. Students are engaged in options such as writing an acrostic poem like the one written to Poe by his wife or creating a timeline of major events in Poe's life, while I assist struggling students with outlining the argument of their essay. Hopefully you can use some of these ideas in your classroom this fall. For an amazing autumn, be sure to enter the giveaway and check out the other blog posts linked below. I love your fall themed informational text! 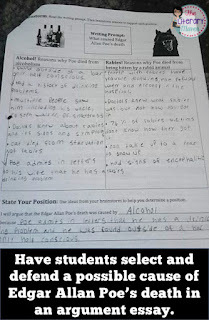 Looks like you have a wonderful variety of ways to keep your students engaged. Thanks for all of the ideas! Love the idea of using the Simpson's episode with The Raven. 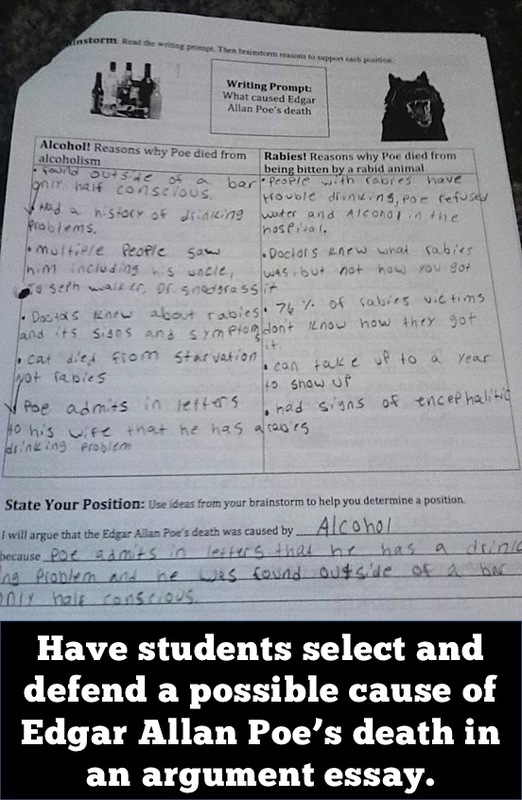 That would definitely make it easier for many kids to relate to!